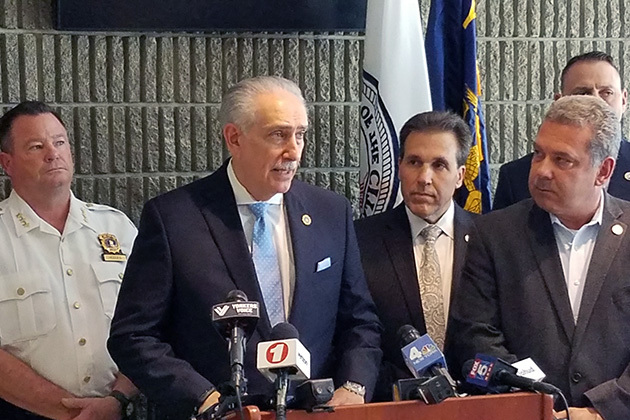 May 2, 2018 -- Today, Mayor Mike Spano, Police Commissioner Charles Gardner, and Westchester County District Attorney Anthony A. Scarpino Jr. announced a series of arrests which took place yesterday throughout the City of Yonkers and surrounding jurisdictions, targeting known members of the Blood Stones gang as a result of an intensive four-month long investigation. ‘Operation: Blood Stone’ is a collaborative law enforcement effort between the Yonkers Police Department and the Gang, Firearms and Narcotics Bureau of the Westchester County District Attorney’s Office. Members from the Yonkers Police Department, including the Emergency Service Unit and with assistance from the Westchester County Department of Public Safety and Departments of County Probation and State Parole, began executing arrests early yesterday morning, targeting twelve offenders who have been the subject of this investigation. The majority of these arrests took place on the west side of our City. During the investigation, Yonkers Police detectives working in collaboration with our partners in the Westchester County District Attorney’s Office, reviewed numerous incidents that were found to be connected to this group of individuals. Detectives conducted multiple interviews, debriefings, viewing of video recordings, physical surveillance and the execution of search warrants. 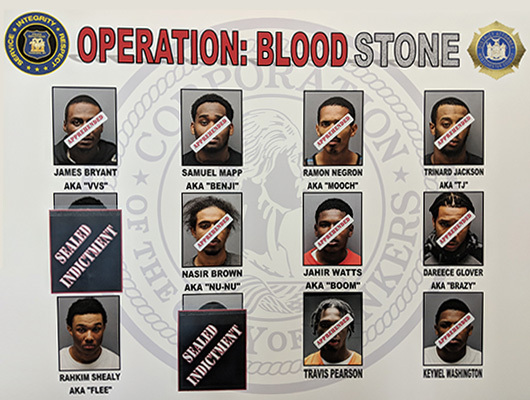 Investigators were able to develop information targeting the Blood Stones gang, which was presented to a grand jury resulting in the indictment of these twelve individuals. The defendants are facing felony charges of varying degrees including but not limited to Attempted Murder, Conspiracy, Criminal Possession of a Weapon, Assault, and Gang Assault. The investigation is spearheaded by detectives assigned to the Yonkers Police Department’s Gang Unit, which is tasked with monitoring, investigating, and apprehending perpetrators of group violence, with assistance from the Third and Fourth Precinct anti-crime units. As of today, nine defendants have been apprehended with three offenders still at large. The investigation is on-going and we anticipate additional arrests – see attached poster for details. Anyone with information regarding the whereabouts of the outstanding offenders is encouraged to contact the Yonkers Police Detective Division at (914) 377-7724 – all calls will remain confidential. 100 percent anonymous tips can be sent by texting the key word YPD plus the tip to 847411. Anonymous tips can also be sent to us directly through the Yonkers PD Tips app which can be downloaded for free to any Apple or Android device.